Thanks for bringing up this tough subject. It makes me think of John Woolman and his efforts to seek for Quakers to realize the horror of what they accepted in the case of slavery. You make some strong points, especially the tests of “Moral Purity,” and “Patience.” If only Christians of my generation had followed these two guidelines so much tragedy, suffering, and heartache would have been avoided. And who’s to know how many wonderful, transforming changes would have come to humankind. 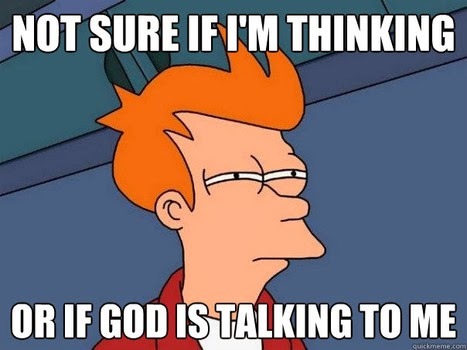 But at 68, I still feel utterly lost when it comes to “knowing” God’s will. I spent many a year caught up in that honest and devout search. I read many Christian books on the topic especially in my teens and twenties. But, often, especially when I had to make major choices, and it wasn’t a question of moral purity, I felt like you mentioned: Why couldn’t we receive from God vivid, lightening-clear direction? In my experience, and after a life-time of involvement in the church (until recently), and a deep knowledge of Christian history, I am convinced that “Consistency with the Bible,” “Tradition,” and “Unity” don’t work, aren’t reliable, and often lead to horrific and evil consequences when followed. Since this is a comment, not my own blog:-) I won’t go into particulars. But suffice to say Christians have justified everything from slavery, to war, to torture, to slaughter of civilians, to persecution to_______ by quoting biblical events and the text, following tradition, and seeking unity. And all of that in my lifetime! And I’ve been a member of a “liberal” yearly meeting. Bad news there too! when it comes to discerning God’s will. Among sincere Quakers there are extreme disagreements about spiritual gifts, prophecy, same sexuality, euthanasia, etc. How is the Friends’ statement “Christ has come to teach us himself” in any sense true? But I am glad that you are still seeking to live in God’s presence. Micah, many times I have had a leading that has gone against what my head has told me to do, but in a good way – calling me to be braver, kinder or just do things differently than I would have done otherwise, and it has turned out to be a better outcome than my original prejudice could ever have produced. So I would I would add one more to your list, albeit only guagable with hindsight: “Works out better than I could have done alone.” Learning to recognise these kind of leadings is difficult, but pays considerable dividends, in my experience. That’s a great way to recognize a true leading after the fact, Jason! Those confirmations are very helpful in feeling secure in decisions made. Some of us do have visions and see the light. These experiences have been shown to be an important part of spiritual experience throughout Quaker and all of religious history and yet we marginalize these friends and push them to the sidelines calling them crazy though they are experiences what our core religious texts say are par for the course. Comments like “my parents would have sent me to a psychiatrist” undermine mystically oriented friends from growing into their gifts and letting their light shine, which I believe is the hope for all friends.